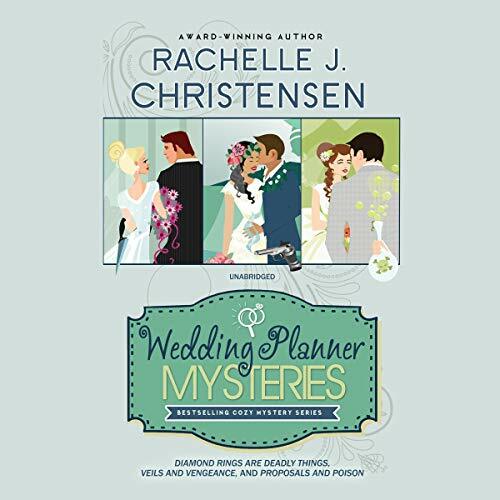 Enjoy all three of the best-selling Wedding Planner mysteries in this box set. Diamond Rings Are Deadly Things: Adrielle Pyper knows how to plan a wedding, and she's especially good at pleasing bridezillas. But when her biggest client and best friend is murdered just three days before the wedding, Adri's world falls apart. She moves to the resort town of Sun Valley, Idaho, and starts from scratch. Thanks to Adri's impeccable taste and unique style, she lands two celebrity clients, and her business seems headed for success - until someone vandalizes the specialty wedding dresses she imported from overseas. Adri must race to uncover the secret hidden within the yards of satin and lace before she becomes the next victim. With a delightful blend of mystery, toe-curling kisses, humor, and spine-tingling thrills, Diamond Rings Are Deadly Things will keep you listening long into the night. Veils and Vengeance: When wedding planner Adrielle Pyper orchestrates a destination ceremony in Hawaii, she's prepared for anything - except murder. After the trauma of her last event, the beautiful isle of Kauai is the perfect place for Adri to unwind and do what she does best: plan. She even lets herself indulge in the attention of the groom's handsome brother. But just when everything seems to be perfect, an afternoon snorkeling trip turns deadly when Adri discovers the body of a young woman. Shaken, but unable to let go, Adri's sleuthing leads her into more danger than she bargained for. When a number of "accidents" threaten her own life, it soon becomes apparent that someone will do anything to keep Adri from interfering with their vengeance. Proposals and Poison: Love can be a very dangerous thing. At least it seems that way to Adri Pyper, the premier wedding planner in Sun Valley, Idaho. When one of her clients dies mysteriously, Adri takes the advice of the local detective and swears she will stay out of the investigation...this time. Luke Stetson's involvement in the case, along with the possibility of a kiss between the two, should be enough incentive to keep Adri out of trouble. But when a dog-themed wedding is almost ruined by a suspect, Adri and her assistant, Lorea, are thrust into private-eye mode. When poison enters the picture, even a reluctant sleuth can't steer clear of danger. ©2015, 2016 Rachelle J. Christensen (P)2015, 2016 Blackstone Audio, Inc.